Many style bloggers function sort of like personal shoppers, showcasing clothes that are in stores now. Not me; I am wearing a lot of my old clothes in these posts. 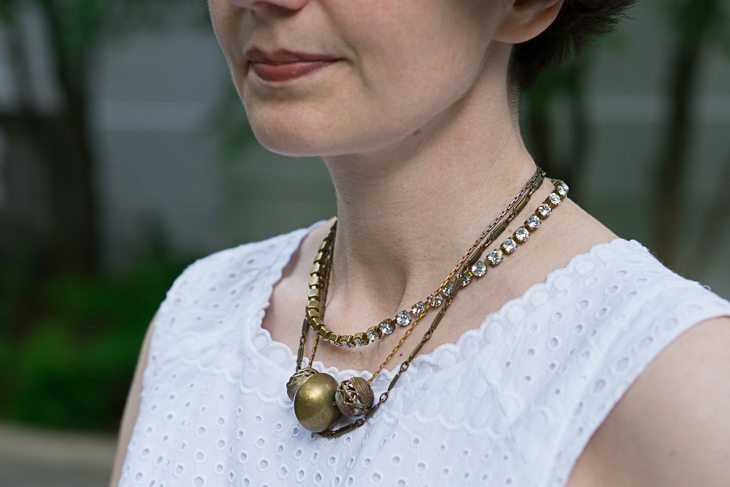 Even when I have something new to show, it may no longer be in stores by the time that the season for wearing it arrives. Neiman Marcus was advertising pre-fall clothes this weekend. For crying out loud, it’s June! Today, in an attempt to show you something timely, I am wearing a deep summer outfit — the kind of thing that I wouldn’t wear until the temperature is solidly over 90 degrees. 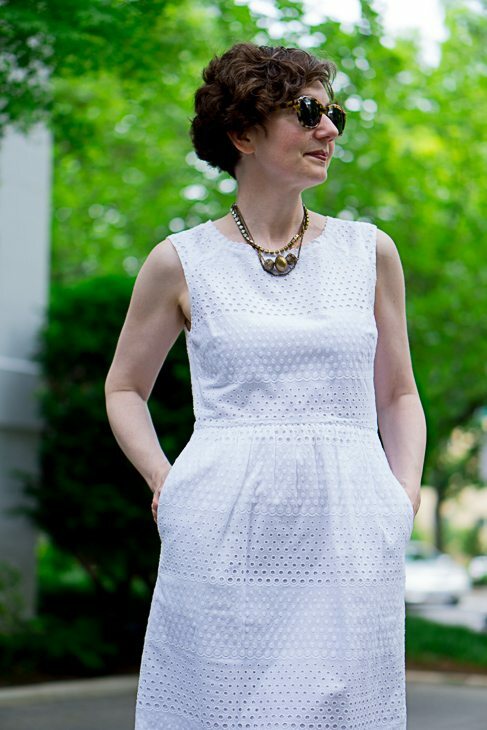 A white sundress in summer is the epitome of seasonal dress, no? Topped only, possibly, by a red dress worn to a Christmas party? 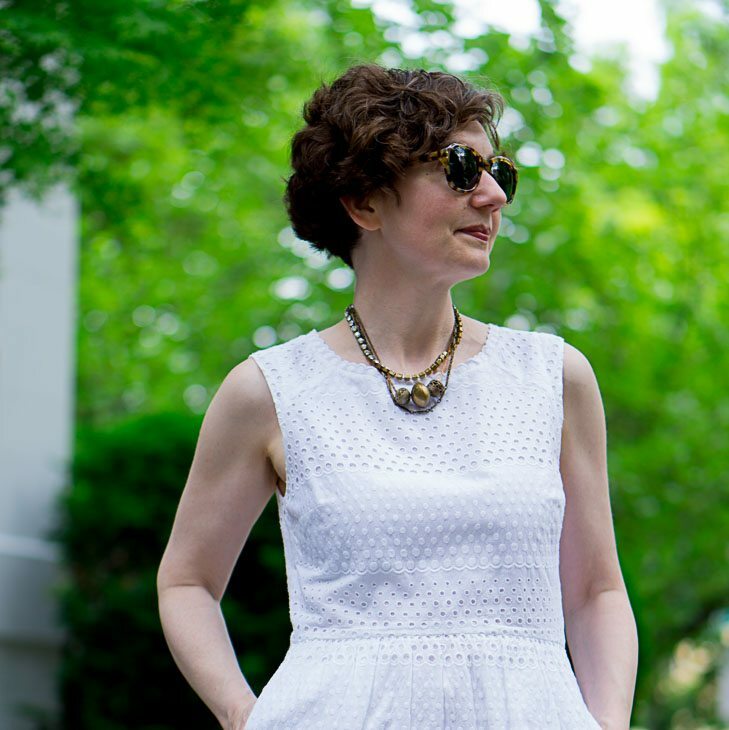 I have two white dresses — one eyelet, one linen — that I like to wear when it’s really hot. Worn with an interesting necklace, a cotton twill jacket, and substantial sandals, it’s perfect for a day at the office when you’ll be working at your desk. Note: My dress is old, so you actually can’t buy it. But some close approximations from this season are provided below, and they are still in stores. 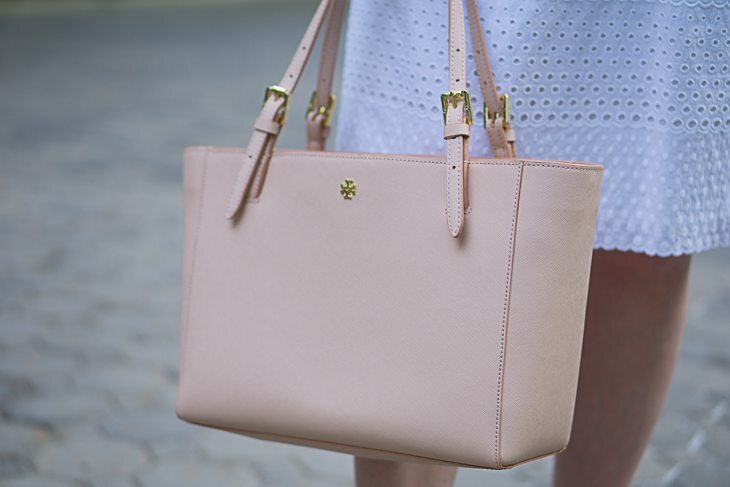 Eyelet is charming in the summer. Over the last two years, I’ve seen lots of dresses in a similar fabric called broderie anglaise. 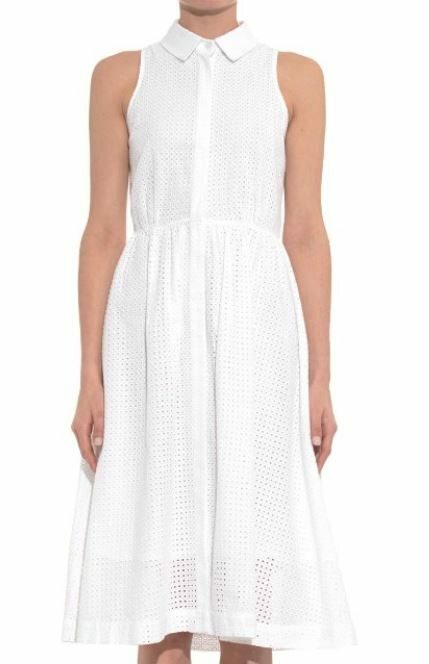 Both eyelet and broderie anglaise are stiff cottons that will give a garment a measure of structure — ideal when the body inside the garment is wilting from heat prostration — but that is only half the genius. Both fabrics feature cutwork (think: perforations) and are thereby breathable. 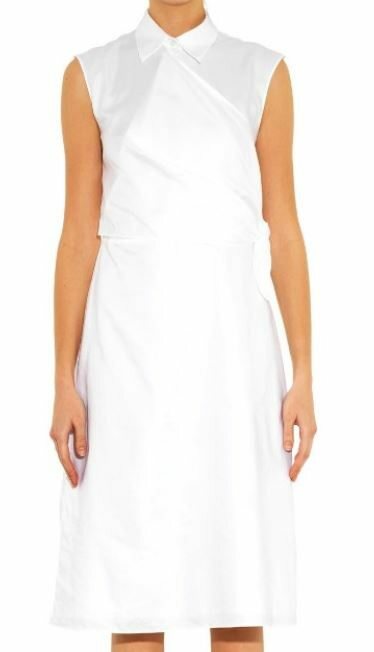 Despite having two white dresses already, I am always looking for others because one never knows when one’s white dress will have a disastrous meeting with a beet salad. Here are the ones that caught my eye this season. And they’re on sale. And today’s special bonus, a dress so beautiful that it’s almost painful to behold. This dress could scarcely be less appropriate for office wear. Even if it had a back, the length and cut seem too dramatic for a desk job. But wouldn’t it be lovely for a fancy party? I too really like pink for summer bags. I did purchase one though too small to prove useful. 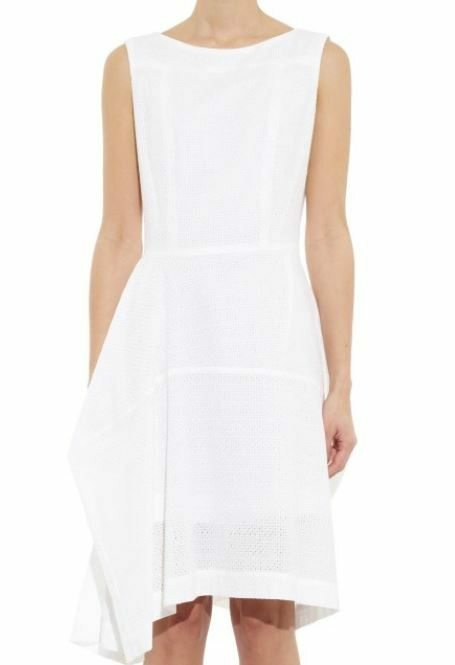 The question of a white dress arises year on year and I have yet to pull the trigger. Your look is cleverly done with the jacket adding comfort. May need to see it on me just that way. Glad you also work from pieces currently in rotation rather than all new. Helps us all. Thanks! There’s so much to love about your blog thus far — the tone, the approach, a post acknowledging the reality that many/most of us wear our wardrobes for years. But I especially want to thank you about the aside about the term “ethnic” — it makes me batty!! Best case scenario, it makes no sense, as you point out. Worst case, it’s a pretty nasty, if inadvertent, display of tokenism. In any case, thanks! Directrice – what do you think about very fair people (e.g. redheads) wearing white dresses? MGT: I have a feeling that this question is personal to you. Fair-skinned people can wear white! I imagine the concern is that the fair skin and white fabric will blend together and be indistinguishable — but no one’s skin is optical white. I would however avoid wearing white head-to-toe. A white dress or skirt book-ended by a jacket and shoes in strong neutrals (khaki, chocolate brown or army green) should do the trick. As you can see, my skin is pretty fair — I have been covered in sunblock since 1993 — and I think it works for me. Good luck and thank you for reading!